Report from Harry Lamb, British delegate on the International Control Commission, to Sir Edward Grey, British Secretary of State for Foreign Affairs, dated 15 July 1914, containing a report by W. A. Fox-Strangways, British consular assistant, dated 15 July 1914, and a letter from Edith Durham to Harry Lamb, dated 15 July 1914, on the chaotic situation in Vlora on the eve of the Greek invasion. published in "People of All Nations"
by J. A. Hammerton, London 1922). It having been reported that the town of Vallona was threatened, on the one side by the Mussulman insurgents and, on the other, by the Epirotes, whilst it appeared certain in any case to be shortly invaded by crowds of famished refugees, I considered it advisable to bring away the remaining archives and other Government property to Durazzo, where it would be less exposed to danger of falling into unauthorised hands. I therefore sent Mr. Consular-Assistant Fox-Strangways to Vallona on the 12th instant with instructions to bring away as much as he might find to be possible without personal risk to himself. The safe, I knew, it would in any case be impossible to remove, but I thought it would be better to empty it of its confidential contents. Mr. Fox-Strangways returned to Durazzo last night, having fulfilled this mission to my entire satisfaction, and I venture to transmit herewith enclosed a memorandum which he has drawn up for me on the state of affairs in Vallona as he left them on his departure. I may add that, the Government having decided that the position was indefensible, General de Weer received instructions to evacuate it completely, and the steamer "Erzegovina" arrived here this morning, bringing with it almost all the remaining gendarmes, the guns that have escaped capture, and all the rifles and ammunition in Government stores. The town is therefore abandoned to its fate. The Italian destroyer "Agordat," the Austrian torpedo-boat "Turul," and the small Russian cruiser "Teretz" are at present the only foreign vessels in the bay. According to information received here yesterday, the Servians, who certainly assisted the insurgents in their recent combat against the Government troops near Starovo, have now occupied that place as well as Kuks, half-way between it and Elbassan. Nothing prevents them from advancing to the latter town, or even as far as Berat, if that is not already in the hands of the Greeks. Having, in accordance with your instructions, proceeded to Vallona to bring up the remaining archives, I reached that place on the morning of the 12th July, and have the honour to report on the situation which I found to exist there. On arriving at Vallona, I found eight of the Dutch gendarmerie officers there, viz., General de Weer, Major Sluys, Commandant de la Place, Captain de Jongh, the three officers from Koritza, Major Snellen, Captain Doormann, and Lieutenant Mallinckrodt, and the two officers from the Tepelen district, Major de Waal and Surgeon-Major de Groot. 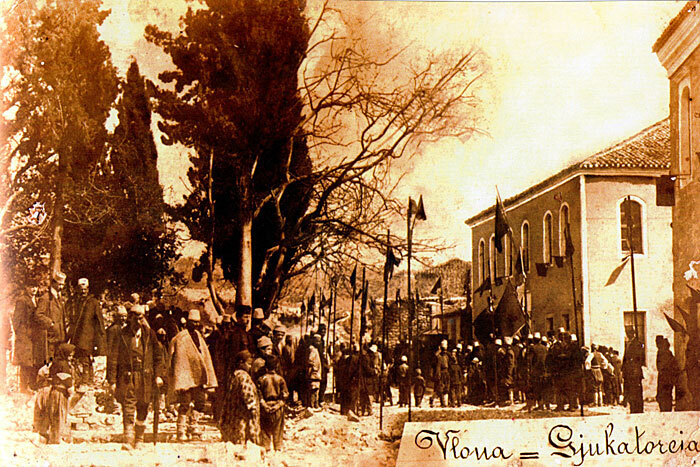 It appears that, on the fall of Koritza, the Dutch officers in Southern Albania, acting probably on the instructions of General de Weer, gave up all idea of further resistance and, instead of falling back on Berat with the main body, made straight for Vallona, leaving only Noureddin Bey Vlora and the Austrian, Ghilardi, to defend Berat. General de Weer has of late repeatedly urged the withdrawal of the Dutch officers from Southern Albania, so that their hasty retreat can hardly be termed a surprise; but it seems slightly incongruous to effect this withdrawal under circumstances which cannot tend to refurbish the somewhat tarnished reputation of those concerned in it. If the Dutch mission really intends to tender its resignation it has chosen an extremely awkward moment for so doing. 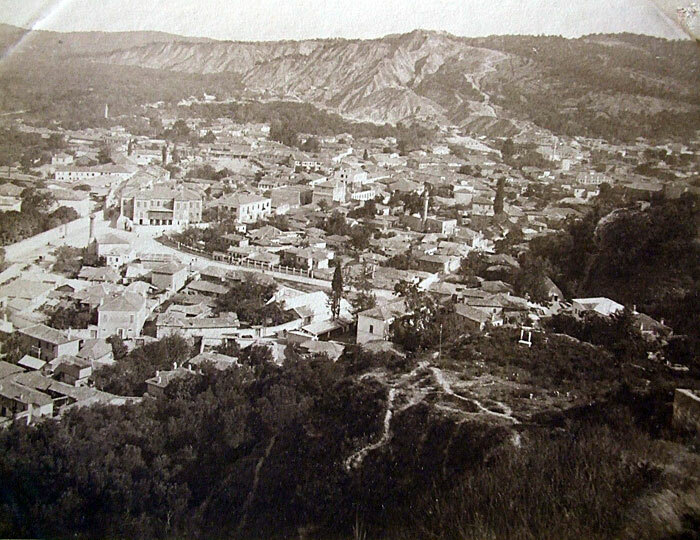 The town of Vallona itself was comparatively calm; it was generally anticipated that Berat would not fall so easily as Koritza had, while it was not thought that the Greeks would dare to advance much further. 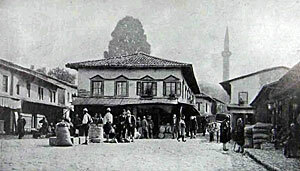 Some surprise, therefore, was caused by the news that Berat had been taken after an assault by the rebels and the Greek Antartes, supported by regulars and cannon. The news reached Vallona on Sunday evening (the 12th instant) and caused considerable consternation. The next day town-criers read a proclamation to the effect that every man capable of carrying a rifle was to present himself at the Prefecture at 2 p.m., whence, after being armed, he was to be sent out to repel the advancing enemy, the penalty for non-compliance with the above being death and the burning of his house. This extraordinary proclamation had the immediate effect of creating a small panic; all shops were closed, and many men fled into the surrounding hills; several townspeople came to me for advice, and I thought it best to acquaint the Russian delegate, the only member of the Commission in Vallona, with the fact; he also had been besieged by bewildered people, and we immediately went to see the prefect, who said that whole thing was a mistake, and ordered a counter-proclamation to be read, calling volunteers only; we also went through the bazaar and had all the shops reopened. I then removed the Government archives to my room in the hotel on the shore, as it appeared likely that, owing to panic, porters and carts would not be available longer. 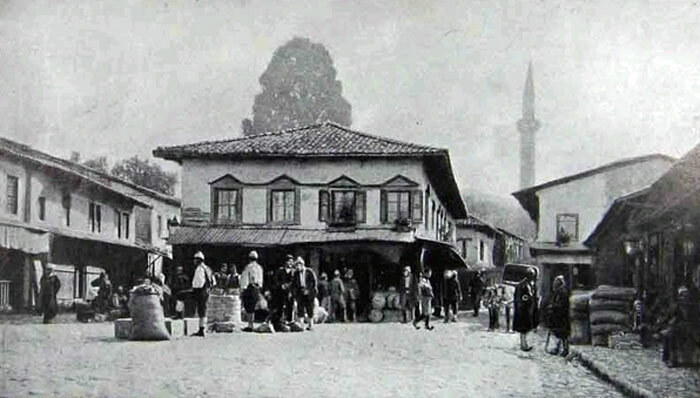 Immediately afterwards, the news arrived that Fieri had been taken by the insurgents, who had advanced very rapidly from Berat (Fieri is only four hours from Vallona). Stragglers from the beaten force and refugees now began to pour into tοwn. Noureddin Bey came in and only Ghilardi, who was reported, I believe incorrectly, to have lost his machine guns at Berat, was left to stem the advance. The position on the evening of the 13th was as bad as well could be. Bektash Tsakrani, of whom I could hear nothing, had obviously confirmed anticipations by joining the rebels; Ghilardi was still fighting, though probably with less than 500 men; Noureddin was in Vallona with perhaps 1,000 utterly undisciplined and untrained volunteers, leavened by an inconsiderable sprinkling of gendarmes; the refugees from Epirus and Southern Albania were pouring in; the townspeople, the not yet completely panic-stricken, were obviously in a fair way to become so; the Dutch officers, with the possible exception of Major Sluys, far from any intention of helping the defence, did not even take the trouble to ensure the proper policing of the town, until the Russian delegate, with the approval of the Austrian consul and myself, made representations to the general on the subject. 1. At Starovo the rebels were helped by Servian regulars, who subsequently occupied the place. 2. The rebels were always helped by foreign officers, principally Servians; there were also Russians with them; one of whom was killed; the buttons of his uniform, as proof, were shown in my hotel by one of Ghilardi's orderlies. 3. The Greeks were throughout helped by regulars. They massacred, with refinements; everyone they encountered—men, women, and children. Many of the refugees killed their own women and children rather than let them fall into the hands of the Greeks. Into the details of the massacre it is not necessary to enter; it is sufficient to say that they surpassed anything seen throughout the whole Balkan war. 4. At Berat a very determined resistance was offered by the loyalists, even the old Venetian bronze cannon being brought into play, and only failed owing to the co-operation of the Greeks with the rebels. 5. The number of refugees from the occupied districts is estimated at from 60,000 to 100:000. It is certain that about half of these will fall victims to Greek barbarity and to hunger. About 7,000 or 8,000 had arrived in Vallona by the morning of the 14th. The entire family of the consular cavass, Kiazim of Skrapari, was amongst the refugees, and has most probably perished since he has been unable to obtain any news of them. The preparations in Vallona for dealing with this influx cannot be said to be inadequate since they are totally inexistent. The authorities have completely lost their heads, and the only person capable of even attempting to deal with the situation is the well-known English philanthropist, Miss Durham, who arrived in Vallona just before I left; but she will require funds for the purpose. Ismail Kemal Bey arrived from Durazzo at 7.30 a.m. on the 14th, but it is difficult to say what his intentions are, though it is strongly suspected that he is once more working in the Greek interest. Many people left for Italy on the "Puglia" steamer. When I left with the archives at 8 a.m. yesterday, it appeared probable that the town would fall the same day, since the rebels were but two or three hours' distant, bile the Greeks were at Dukati and Berat. Finally, the general impression at Vallona, to which I fully subscribe, was that the Greeks, in defiance of the London Conference, and the subsequent Corfu Arrangement, have every intention of entering Vallona, where they will probably justify their reputation by "Hellenising" the place in their own particular manner, viz., the extermination of the non-Greek element. The number of refugees so far as I can make out has been very greatly exaggerated. As Mr Strangways will have told you there was a sort of panic yesterday and a number of people poured onto the steamer for Constantinople. A good many hundred – how many I could not ascertain – all I believe from the Kolonia and Frasheri and Koritza districts. Later a good many families from Leskovik and Kolonia arrived. I visited them – or most of them I believe. They give very bad reports of having seen villages in flames and that at Skrapari a lot of the refugees were cut off by the Greeks en route and slaughtered. But I can get no precise figures. Personally I have certainly not seen more than 2000 at the outside – less I fancy. But Tsilka declares relief was given out to 7613, but many of these are in houses in the town. The most to be pitied are the band of genuine Koritza patriots who are in great distress at the ruin of their hopes. Many have worked hard for years for their national cause and have lost most of their possessions. 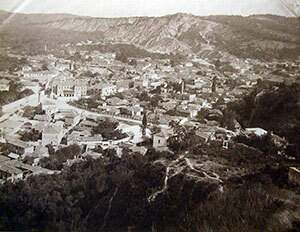 The inhabitants of Batska a village near Skrapari are said to be all massacred. And as they were anti-Greek it is possible. Most of the refugees now squatting out under the trees here are those who were burnt out in April by the Greeks and earlier and who have fled with the Koritzans. Tales are rife of the part played by Russian and French agents. Dervish Bey of Elbassan, prisoner on the Herzegovina, assures Tsilka that Essad’s plans were supported by England! Which I have of course contradicted. But people seem to believe that the whole Triple Entente is guilty of all this miserable intrigue. People here want to resist though it seems rather mad to me. I do not believe the place is defensible. Especially to fight the rebels would I think be foolish. We are told both Greeks and rebels are at Berat but so far they have given no sign of advancing. I gather that the statements of the American Spencer are likely to be exaggerated. But with all allowances made there is a remainder here of wretched people who are destitute – the victims of all the horde of European brigands who have brought about the situation. I shall go round them again and see if more have arrived. Wild tales of numbers more coming down from Tepelen are not at present corroborated. But it seems certain the town itself and its villages are burnt. The Dakos and a large contingent of Koritzans are said to have fled to Starovo en route for Monastir. Tsilka is in distress as he hears that his wife has fled into the Spata mountains from Elbassan.